58 characters from Capcom, Sega, Bandai Namco and now Nintendo are teaming up for another insane 3DS adventure, when Project X Zone 2 comes stateside this February. Project X Zone 2 [Brave New World] is already available for Japanese gamers, though North America won’t see the 3DS-exclusive Capcom/Sega/Bandai Namco/Nintendo cross-over until early 2016. Fans may have noticed the inclusion of “Nintendo” in the list of represented companies; Fire Emblem Awakening‘s Chrom and Lucina will be a playable “Paired Unit”, along with Xenoblade‘s Fiora partnered with KOS-MOS (Xenosaga). Developer Monolith Soft originally planned for a simultaneous international release window for their wild tactical-RPG, however the North American and European versions faced a slight delay; there is a silver lining however, as Project X Zone 2 has been officially dated for Feb. 16. Those who pre-order the 3DS-exclusive will receive a Nintendo 3DS Home Theme and additional in-game extras; owners will receive the Challenge Stage “The Woman From 10 Years Ago”, a NA-exclusive “Sun Sword”, “Diamond Medal Accessory” and “Amethyst Medal Accessory”. 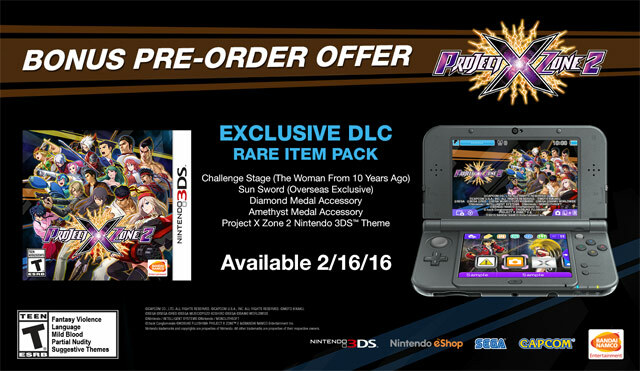 Again, Project X Zone 2 will release exclusively for the 3DS on 2/16.